PASCAGOULA, Miss., June 12, 2010 (GLOBE NEWSWIRE) -- The U.S. Navy, Marine Corps and Northrop Grumman Corporation (NYSE:NOC) today christened the sixth LPD 17 class amphibious transport dock ship San Diego (LPD 22) in front of more than 1,000 guests at the company's Shipbuilding sector facilities in Pascagoula, Miss. "Since 1775 when the Continental Congress created the Navy and the Marine Corps, sailors and Marines have gone to sea in ships to defend our great nation," said Gen. James F. Amos, assistant commandant of the Marine Corps, who delivered the ceremony's principal address. "As America grew in power, our ships grew bigger and more sophisticated. The San Diego is no exception. She and her sister ships are extraordinary in their capability and capacity. This is both necessary and good because she can expect to be called upon time and time again to take her crew and her compliment of Marines into harm's way." In his ceremony remarks, Mike Petters, corporate vice president and president of Northrop Grumman Shipbuilding, recognized several shipbuilders constructing LPD 22 and how their work ethic demonstrates the shipyard's overall effort to improve first-time quality. "Quality is a major focus on every LPD with the incorporation of lessons-learned, better measuring tools and a rigorous class build plan," said Petters. San Diego, which is 77 percent complete, is the most complete LPD to-date at time of launch. 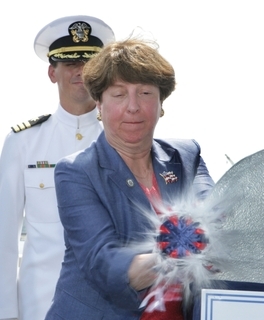 Ship's sponsor Linda Engel Winter, wife of former Secretary of the Navy Don Winter, capped off the day's activities when she smashed a bottle across the bow of the ship officially christening LPD 22, San Diego. "The skill, the strength, the experience and the knowledge the shipbuilders have put into building this ship is as much a part of that ship as whatever spirit that I, as sponsor, am able to give her," said Mrs. Winter. LPD 22 honors the city of San Diego which is home to a large number of the Pacific Fleet's ships. Three previous ships carried the name San Diego - the armored cruiser (ACR 6) named in 1914, the World War II-era cruiser (CL 53) commissioned in 1942 and the combat stores ship (AFS 6) commissioned in 1969. Sean Stackley, assistant secretary of the Navy for research, development and acquisition, was working on the LPD program on Sept. 11, 2001. "That day was met by new resolve," said Stackley. "The hard-working, dedicated shipbuilder on the Gulf Coast brought to work not only his hard hat and toolkit, but his pride and patriotism. We must be singular in our purpose and in our actions to take care of these men and women who wear the blue and green...to place in their hands the tools that they need to win the war we're in and to return home safely." Cmdr. Jon Haydel, of Houston, Texas, is the ship's prospective commanding officer and will lead a crew of 360 officers and enlisted Navy personnel and three Marines. The ship is capable of embarking a landing force of up to 800 Marines. "We place unique standards of excellence on our engineers and shipbuilders, for they are building ships that must take our Sailors and Marines, America's sons and daughters, into and out of harm's way," said U.S. Navy Rear Adm. William E. Landay III, program executive officer, Ships. "I can tell you there are no more dedicated, skilled or passionate artisans anywhere in the world. The United States Navy is the preeminent naval power in the world because of the powerful combination of the American sailor and the American shipbuilder." San Diego is 684 feet in length, has an overall beam of 105 feet, a navigational draft of 23 feet and displaces approximately 24,900 tons. Four turbo-charged diesels power the ship to sustained speeds of 22 knots. As an element of future expeditionary strike groups, LPD 22 will support the Marine Corps "mobility triad," which consists of the landing craft air cushion vehicle (LCAC), the Expeditionary Fighting Vehicle (EFV) and the Osprey tilt-rotor aircraft (MV-22). The ship will provide improved warfighting capabilities including an advanced command-and-control suite, increased lift-capability in vehicle and cargo-carrying capacity and advanced ship-survivability features.